Is there anyone out there??! I don't think I've had as long a break from blogging before. The house is taking up all my time (I started this post 12 hours ago!) and each day I rotate a very boring jumper/jeans/puffa jacket ensemble in shades of navy or grey. But I'm actually enjoying this forced capsule as it's so easy to dress....and it's inspired me to do a massive clear-out before my new wardrobe goes in during February. More on that when it comes - the hanging rails are melting my head! 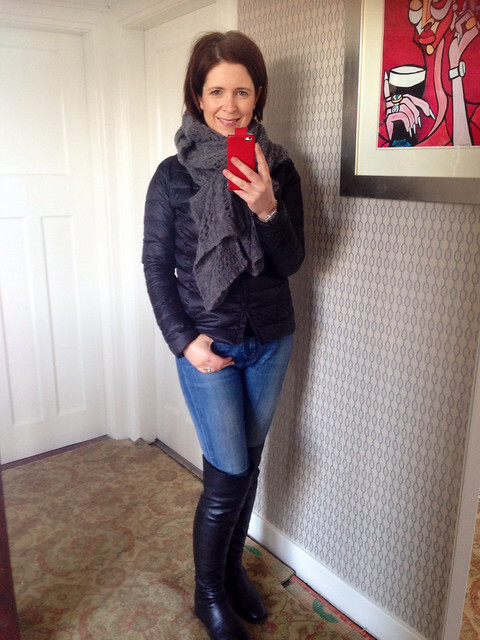 So a quick return to blogging to show off one of my successful sales purchases - over the knee boots. The long black flat boots I already had were on their 4th winter and were starting to show it - especially as they were the only boots I had in my capsule after we moved so they were worn almost every day during December. I decided to look for another pair in the sales but this time to get some over the knee ones. On Boxing Day, I tried on several pairs in Belfast but couldn't get my size so ordered them online. The try-on however helped me get a feel for what style suited best so I knew I wanted ones that were well over the knee at the front but open at the back, ideally with some detail down the back of the boot. I almost bought a pair that had buckles behind the knee to secure the front piece better but decided that would be a bit of a faff every time I had to put them on...they did give a nice slimline look to the leg though. So here are the ones I bought - the Dune Torz boot - available in a few shops but the best price is at Zalando here and Amazon here - both coming in at about £80. The first thing that won me over is the quality of the leather and the smell from it. Just glorious. Even after a few weeks, I'm aware of it as I sit here typing this. Next was the ease of putting them on. The zip at the back is only a detail. there's actually a half zip on the inner leg that allows you to pull the boots right on and it's easy to zip up. They come well over my knee and I've had no issues with sagging. Size wise, I'd say they come up a bit big so if between sizes, go down. Mine are a 39. Amazingly I've not had any smart comments from the hubby...and my mother in law compliments them every time I wear them. So they mustn't look too 'Pretty Woman' :) In terms of wearing with skirts, I've not had as much luck. Just didn't work but I've never been a fan of long boots with skirts on me anyway. I'm off now to pack bags - the kids and I move back in with my mother in law tomorrow for a few weeks while the old kitchen is taken out and replaced, along with the gas boiler. It's going to be a long 3 or 4 weeks but this is the last big piece of work we need to do so I'm keeping focussed on how lovely it will be to have a proper working kitchen again. On the plus-side, being at granny's will hopefully give me more time in the evenings to blog - I've still to tell you about my my life-changing nocturnal lenses. I promise to dedicate my next post to them. Hope you're all keeping well and that 2015 is treating you well so far..
Love those boots on you Avril, I have a pair and I think they compliment the body really well. Exciting times with the house move! good luck with the kitchen, and nice to see you back. i love over the knee boots - those are so smart. Good luck with the house! hELLO! yES, WE'RE ALL STILL OUT HERE :) lOVE THE BOOTS - I'M DETERMINED TO GET A PAIR THIS YEAR. THEY LOOK FAB ON YOU. gLAD TO HEAR YOU'RE MAKING PROGRESS WTIH THE HOUSE. iT WILL SOOO BE WORTH IT WHEN YOU'RE FINISHED! Very foxy! I've been on the hUnt For a pair too but the only ones i loved were sold out. GlAd there's an end in sight with the House! Yay, you're back!! have felt almost stalker-ish over the hols, kept checking in and feeling blue. wow, THEY look absolutely stunning on you - perfect fit and make you look hot 20yr old mamma! I'm not a fan of over the knee but these look great. welcome back! :) Hope you are surviving the refurb! Hi, Ive only found your blog today via another bloggers site. I saw these over the knee boots on you and ordered them straight away, they look great, hope they look as good on me. I must say they don't look too good on the Zalander site as they are shown with the flap turned down, I wouldnt have ordered them if I hadn't seen them on you. I've been looking for a pair for months, can't wait for them to arrive. Thanks and I have subscribed. Hi, just to let you know, I love these boots,. I have arthritis so my knees are a bit swollen so they are a little tight but because of the open back they fit ok and are softening up nicely. They actually disguise my knees which is what I wanted. Thank you once again,.